A powerful diagramming tool that automatically creates your presentation in an instant. Then you can share your ideas easily on any platform in various formats, including Word, PowerPoint, and Excel and so on. Discover how you can instantly make attractive, attention-getting, presentation-quality presentations that captivate your audience... In as little as 5-10 minutes. Just rely on a professional and powerful tool. To personalize your presentation and gain marvelous slides don't need to be time and effort-consuming. Actually, you can do it effortlessly in minutes with a professional and powerful tool - Edraw. If you opt for Edraw's ready-made templates or examples, it will be as quick as lighting. 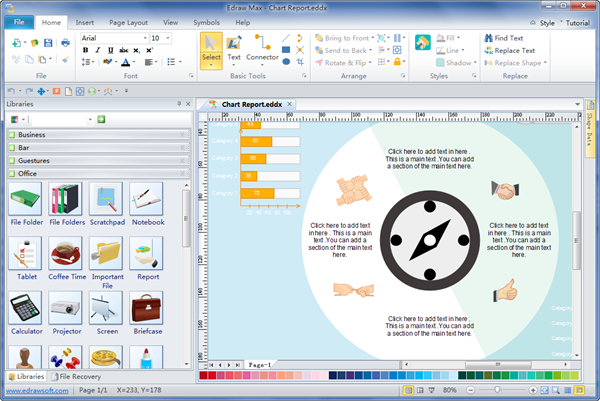 It also offers a larger number of backgrounds and clipart for users to enrich and glorify their presentation. From now on, you can create creative presentation easily. Learn to create premier presentation in a breeze to better share your discovery. Acquire an easy solution to Enrich, Enhance and Empower Your Presentation. Discover why Edraw is an awesome presentation designer: Download it Now. 1. Select a suitable template. Start Edraw, choose the Presentation group under File menu, then the inbuilt presentation templates all appear on the right. Double click one icon to see whether it suits your need. If not, select another one. 2. Enter your contents. The shapes in all presentation templates are designed with text boxes. When one shape is resized, its text box also changes automatically. 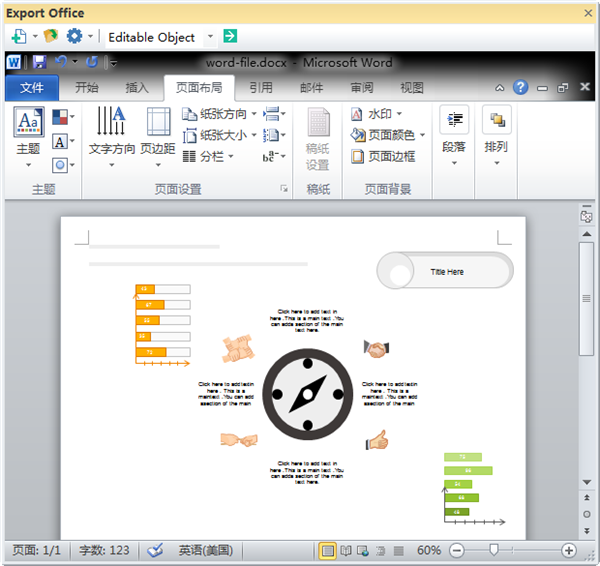 In MS PowerPoint, the shape and text box can only be added separately, which in very inconvenient and time-consuming. 3. Check and save the presentation. Press F7 to check the spelling. Click File and then click Save As.../strong> to save the file. The default format is editable eddx. You can export it to many other commonly used formats to share your ideas. You don't always have to rely on PowerPoint to gain PPT slides. Actually, you can use a slide maker better than PowerPoint to make slideshow faster. Its advantages lie in the abundant visualization models that are impossible to gain through PowerPoint. After you modify the Edraw template, you can turn the file into pptx format with only 3 clicks. 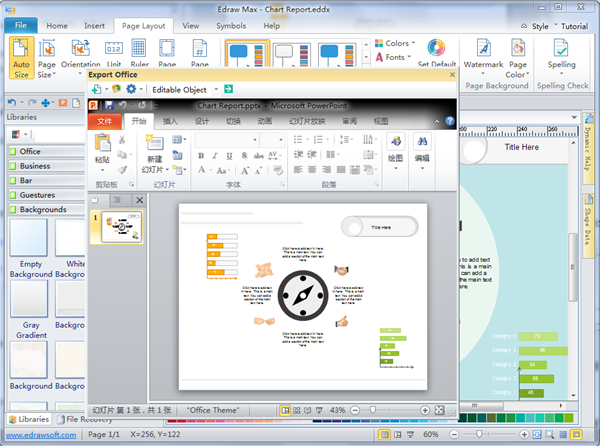 The MS PowerPoint document window will open within Edraw. 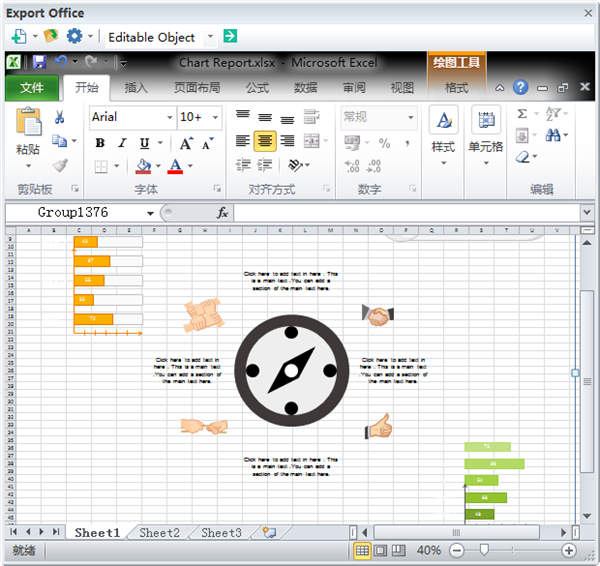 The diagram is exported to a MS PowerPoint document immediately, in editable format. Similarly, you can also export the file into commonly used Word format and then share it with others. They will surely be amazed by your work that is inclusive and attractive with stunning visual materials. Just click the Export to Excel button in the Ribbon menu after you finish your work in Edraw. Hundreds of ready-made templates and examples for quick start. Vector, smart and editable shapes with connection points and text boxes, making editing a whole lot easier. Flexible presentation mode allows editing even in full screen mode. Drag and drop interface and dynamic user guide ensure simple and easy design process. Advanced interaction functions like inserting hyperlinks and attachment. All examples are free for download and print with various formats available. More templates and examples will be added continuously. One purchase for lifelong updates. Isn't it amazing? Here are all available presentation examples created by Edraw. Download this amazing software and you'll wow audiences and get your point across effectively in no time.